Currently, everything is going digital and individuals carry out their routine tasks online. Having visually appealing and user-friendly websites are nowadays extremely essential for every online business owner to flourish. While you create a website, the latest technology plays a vital role, undoubtedly, but there is one more thing which is even more important and that is the content. The website content is very essential for all the digital marketing processes therefore, it is very essential to manage the content. CMS has created a lot of buzz in the reputed cms development company due to the numerous advantages associated with it. And if you are looking forward to launch your website sometime soon then, you surely should be thinking about hiring the best CMS development services for growing your online business exponentially. Previously, business owners do not have to depend heavily on the static web-pages for uploading it directly to the servers for publishing their websites. But all thanks to the advent of feature-rich CMS that all these things have changed, with functionalities like making a workflow, facilitating access control together with supporting the new modules and incorporating perfectly with other company services became effortlessly and readily accessible for its users. Creating a website right from the scratch without any CMS, business owners will get easily lost and confused in your computer screen, waste lot of working hours to pick the right font or website layout, and other individual aspects while still not getting satisfied finally. However, with hiring professional CMS development services and having a feature-rich CMS you can easily develop web-pages and websites in moderately less time together with simply and effectively publishing content which, consecutively will lead to quicker and resourceful updates. As individuals make use of a wide assortment of mobile devices to easily access web applications, the significance of a responsive website design could not be underestimated. Mobile content management through different features like navigation, readability and user-friendliness plays a vital role to make your website responsive and deliver an improved user experience. Choosing an open source CMS will significantly assist trim down the cost of developing and maintaining your website. You can save the money that you might pay to the CMS web developer for each minor change you require making each time, as you can update the content easily on your own. CMS enables you to create a content marketing plan through optimizing your Meta tags by a single source location on the basis of the data collected through leads, sales and web traffic and also deliver smart suggestions for best practices. Advanced CMSs boosts your search engine rankings through creating clickable links, adding paragraph tags and recommending numerous formatting practices, external contribution like comments, likes, forums and a lot more for keeping your website appropriate. CMS has made the content sharing process easier through consolidating the content in one repository that further diminishes content redundancy but integrated a workflow engine that facilitates content creation, editing and approval through a mutual effort by the multiple contributors prior to publishing it. It even trims down the safety threats through offering unique IDs for enabling access to the authorized users only so eliminating the possibilities of any illegal access to your content. The biggest reason why you must hire professional cms development company and using a CMS is that of its handy customization solutions and flexibility. Your website do not have to experience a complete website revamp every time you require adding few new features since the content, functionality and website design could be managed individually without affecting the others. 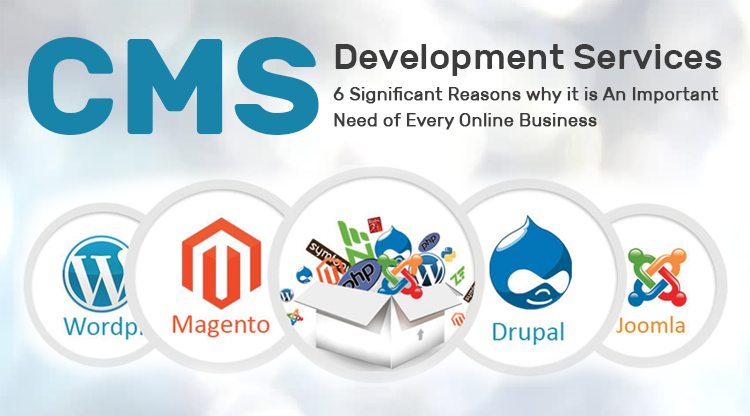 The advanced CMSs come with numerous features and sufficient customization possibilities that can be used productively to develop and run any kind of website, whether it is a small business enterprise or a big multinational corporation. You can also hire professional CMS development services to get everything handled effectively and in a hassle-free manner.